The Center for Pragmatic Buddhism is a public organization which promotes the practice and study of Pragmatic Buddhism as governed by the Order of Pragmatic Buddhists. 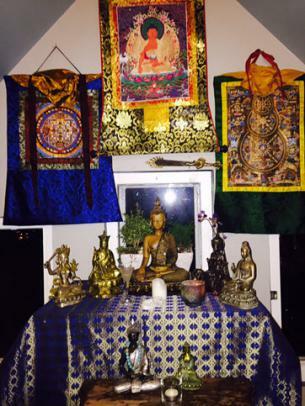 Our current focus is on developing a Western Buddhist tradition that reaches and resonates with Westerners and their unique cultural background. The Order of Pragmatic Buddhists (OPB) is a school of contemporary Buddhism that embraces an historical appreciation of Buddhism and its pragmatic value. Our approach includes the incorporation of Western worldviews, particularly American Pragmatism (and its successor, Neopragmatism), Western naturalism and science. The Center for Pragmatic Buddhism's teachers are members of OPB, and receive extensive formal training in Pragmatic Buddhist thought and practice. The Order of Pragmatic Buddhists highlight the humanity of our monastics and the pragmatism of our methods. The education of monastics in OPB takes place in a training format similar to Western education, with emphasis placed on a social educational experience in addition to the traditional teacher-student relationship. While we recognize and study the importance of Buddhist history and traditional methods, we understand that contemporary efficacy is determined by contemporary applicability. Our intention is to convey Buddhist teaching and practice in a way that Westerners can understand, appreciate, and apply to their everyday lives. The centrality of meditative practice is an essential element of Pragmatic Buddhist practice, as it leads to cultivation of awareness, knowledge of dependent origination, insight into harmonious actions, and the development of positive personal characteristics that result in a better world for everyone. CPB is comprised of the original St. Louis sangha of Dragon Flower Chan Temple under the direction of Ryugen Fisher (Ven. Shi Shen Long) until his passing. Ryugen ensured the continuation of his late vision of Pragmatic Buddhism by teaching Jim Eubanks (Shi Yong Xiang) as his formal student from September 2003 to his untimely death in October 2006. In December 2006, the American Chan Buddhist Center (ACBC) was founded by Ryugen's St. Louis sangha and Jim was appointed Monastic Director. In February 2008, ACBC appropriately changed its name to better reflect its approach to Buddhism, becoming the Center of Pragmatic Buddhism (CPB). It is important that OPB recognize the pivotal teachers who have contributed to the teachings we embrace today. Ryugen Fisher and Jim Eubanks. The lineage of our Order stems from both Chinese Chan and Japanese Zen roots. The Reverend Soyu Matsuoka was a Japanese Soto Zen Master who studied at Sojiji Monastery in Japan before being assigned to temples in the United States. Matsuoka was Ryugen Fisher's root teacher who first gave him the precepts. Holmes Welch, a widely respected professor of Chinese Buddhism and Daoism conducted extensive research in China during the early part of the 20th century, learning intimately the details of Chinese Chan thought and practice. His work culminated in "The Practice of Chinese Buddhism: 1900-1950," the first of a three volume series still in print today. While living in China at the Chin Shan Monastery, Professor Welch Professor Welch (Shi Mo Hua) received dharma transmission from the then abbot, Tai-Ts'ang Hsin-Jan. Ryugen became his personal student, providing him with rare opportunities to study classical Chinese Chan texts and their practice. During his lifetime Ryugen viewed his "pragmatic" approach to Buddhism as "American Chan." Pragmatic Buddhism has now emerged to better describe the continued evolution of the Buddhist practice and teachings of the Center for Pragmatic Buddhism. The vision of CPB is dedicated to his memory and hope for a meaningful practice that speaks directly to Americans. Ryugen's life was devoted to helping others see the value of "rigorous self-honesty," the first step towards positive self-transformation. His simple yet profound teaching methods reside at the heart of our practice at the Center for Pragmatic Buddhism. The highest motive is to be like water. Water is necessary to all living beings, yet asks nothing in return, rather it flows humbly to the lowest level. Nothing is weaker than water, yet against those things that are strong and hard, nothing can surpass it nor stand in its way. May we all learn the Way of Water! David Shaner Sensei and Jim Eubanks Sensei. After the passing of Ryugen Sensei, Shaner Sensei became Jim Eubanks' primary teacher. He is integral to the development of Pragmatic Buddhism through this relationship with Jim. Shaner Sensei's own lineage includes extensive study as a personal student (uchi deshi) of Koichi Tohei Sensei. Dr. Shaner has studied as an expert in Buddhism and comparative philosophy (Indian, Chinese, Japanese) with some of the leading Western authorities, including David J. Kalupahana and Thomas P. Kasulis.